This study provides a critical appraisal of intermediaries in demand-driven workforce development. 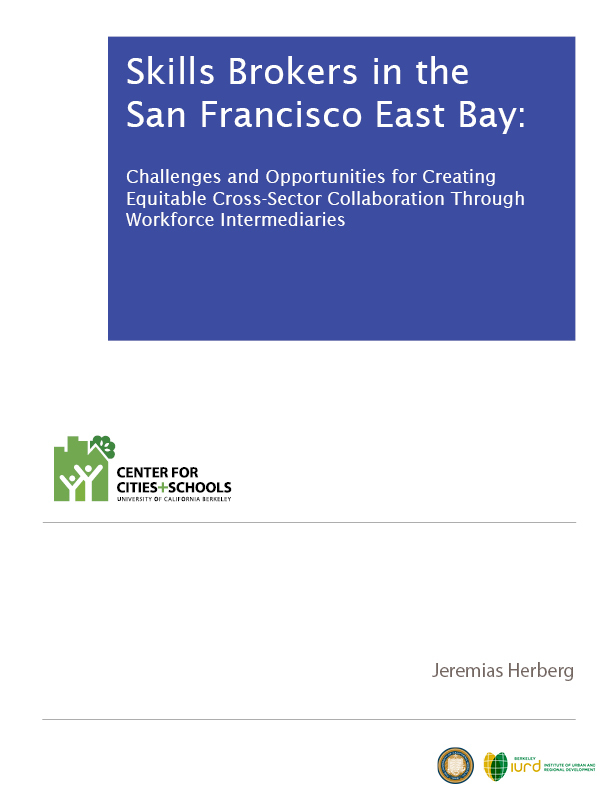 In San Francisco East Bay, an emerging set of workforce intermediaries – here called the” Skills Brokers” – recently take issue in alleged Skills Gaps to create a cross-sector reform agenda. They seek to connect the supply and demand for STEM skills to mediate between the booming technology industries and educational crises. Against the backdrop of structural education-industry interconnections, however, the report suggests a shift in focus: It is argued that the Skills Brokers are valuable in facilitating boundary-crossing collaboration, but their orientation towards employer demands may perpetuate educational inequities while downplaying employer responsibilities. An altered focus on supporting upward-mobility pathways requires a more proactive role by Skills Brokers that scrutinizes and shapes employer demands. In 2017, the California Department of Education (CDE) announced the “Small School District Assistance Initiative,” aimed at providing targeted assistance to small and rural school districts in the state. 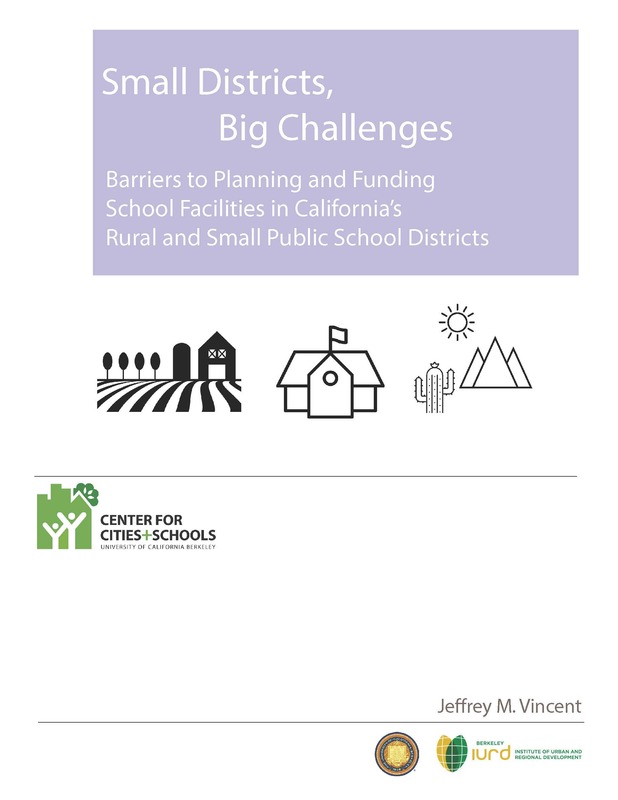 To aid CDE’s efforts, this study investigates the facility challenges and issues facing rural and small school districts in California. 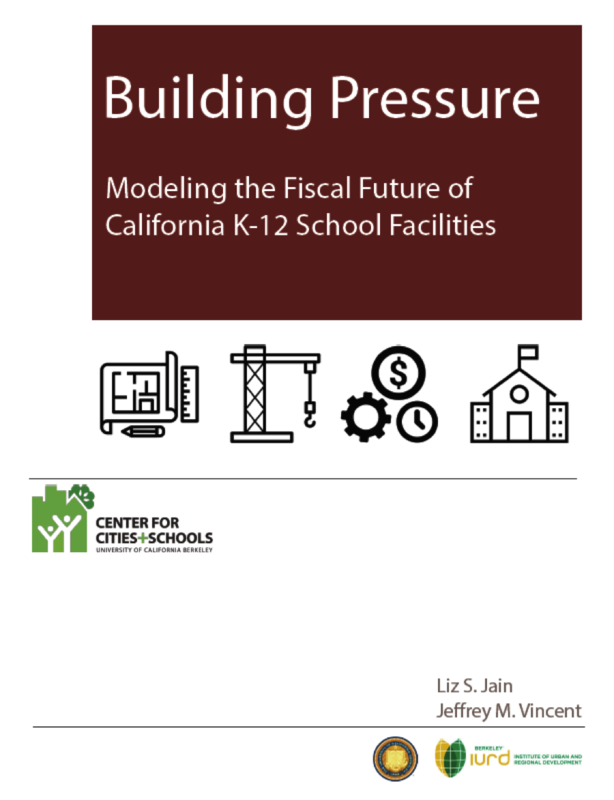 We utilize a mixed method approach to understand the capital investment patterns and facility planning processes of rural and small public school districts in California. 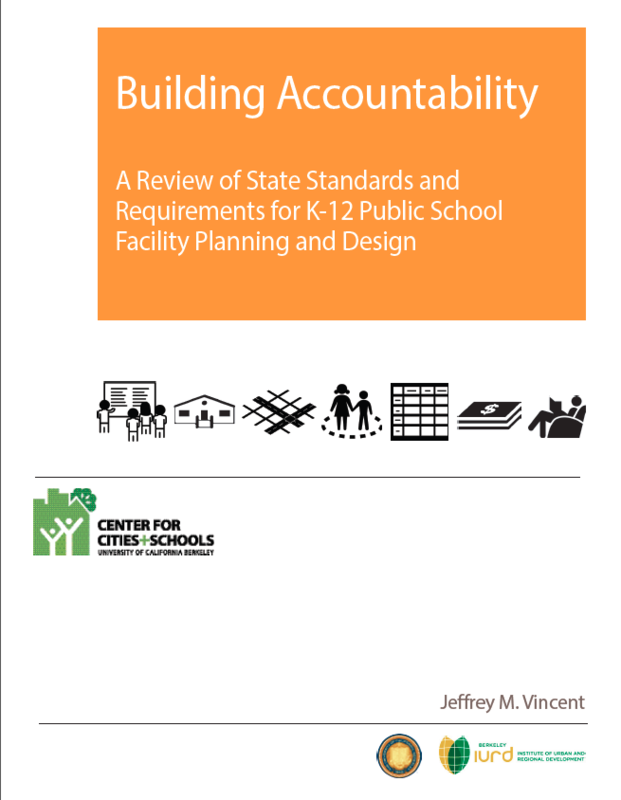 In Part II we present findings from analysis of school district data on facility-related characteristics and spending trends. 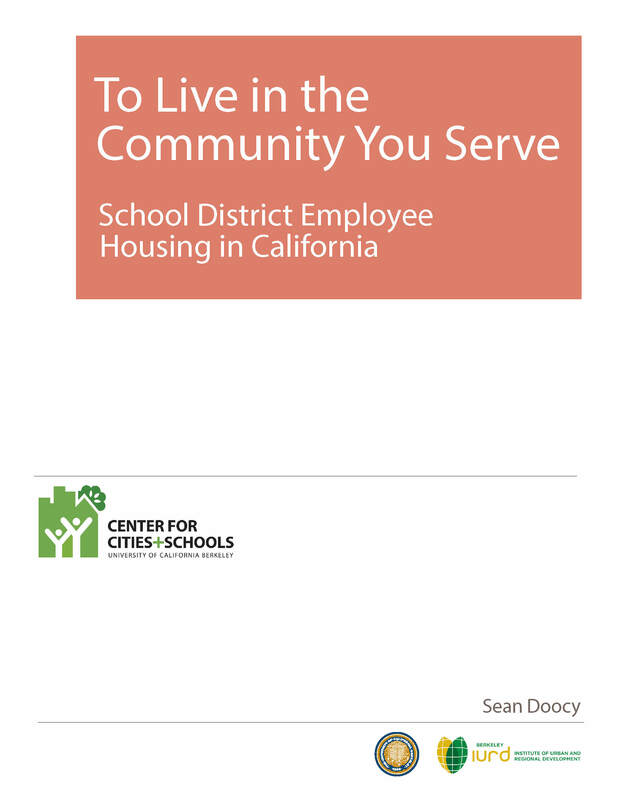 In Part III, we present findings from interviews with 40 rural and small school district officials from across California. 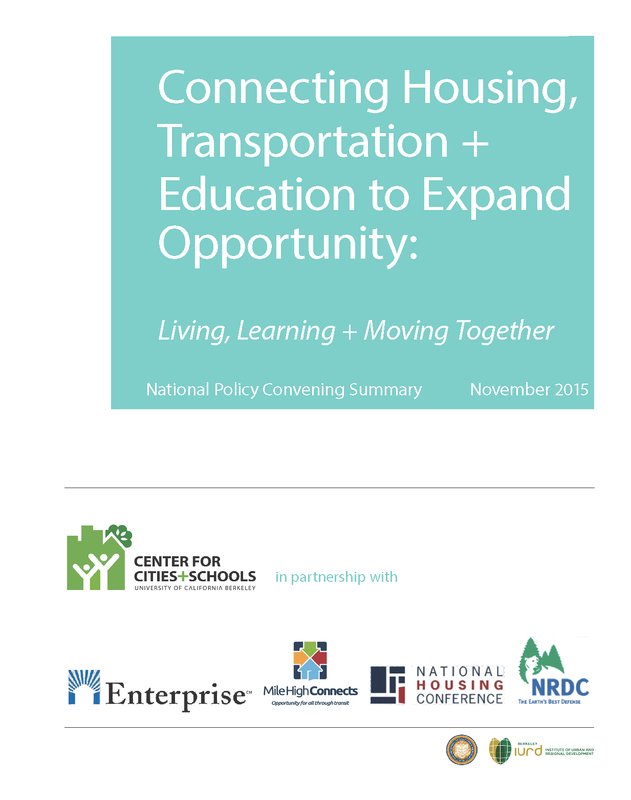 As California looks to implement a Health in All Policies approach into state decision making, and weave health, equity, and environmental sustainabil ity into more policies, a better understanding of the relationship between school siting and walkability is needed, particularly considering that the state provides funds to school districts for new school construction projects. This study measures the walkability around a sample of schools sited and constructed in six high-growth counties in California from 2003-2011. Our country’s elementary and secondary (PK–12) public school infrastructure is in crisis. Every day, millions of children in the U.S. attend public school in unhealthy,unsafe, educationally inadequate, environmentally unsustainable, and financially inefficient facilities. Our public school facilities have broad impacts on children and communities: student, staff, and community health; school quality and academic achievement; economic development; and environment and natural resources. We need effective and efficient systems to ensure responsible stewardship of our PK-12 public school infrastructure. 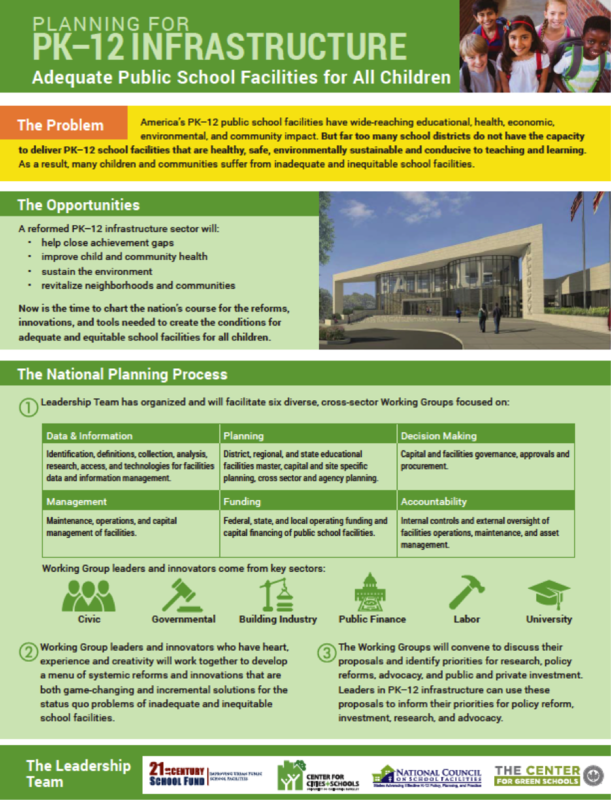 With much at stake, national leaders launched the Planning for PK-12 Infrastructure Initiative (P4si Initiative) in 2016 to formulate a systems-based plan to address the PK-12 infrastructure crisis. 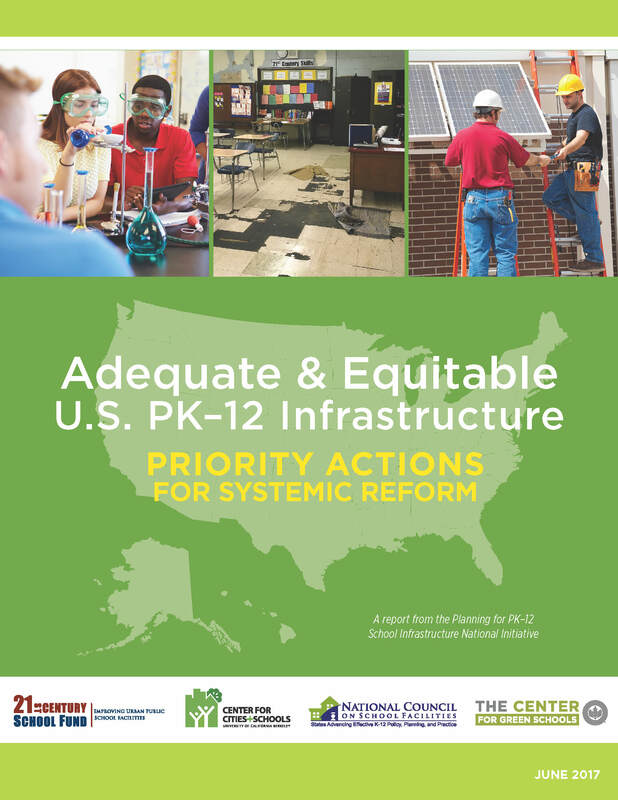 This report presents findings from the Phase 1 national research engagement process to identify the challenges to adequacy and equity in PK-12 infrastructure and to propose system reforms. Our recommended priority actions are designed to develop and support the essentials for modern PK-12 public infrastructure stewardship. Phase 2 of the P4si Initiative will move the 55 priority actions forward to achieve a paradigm shift in our PK-12 public infrastructure systems. 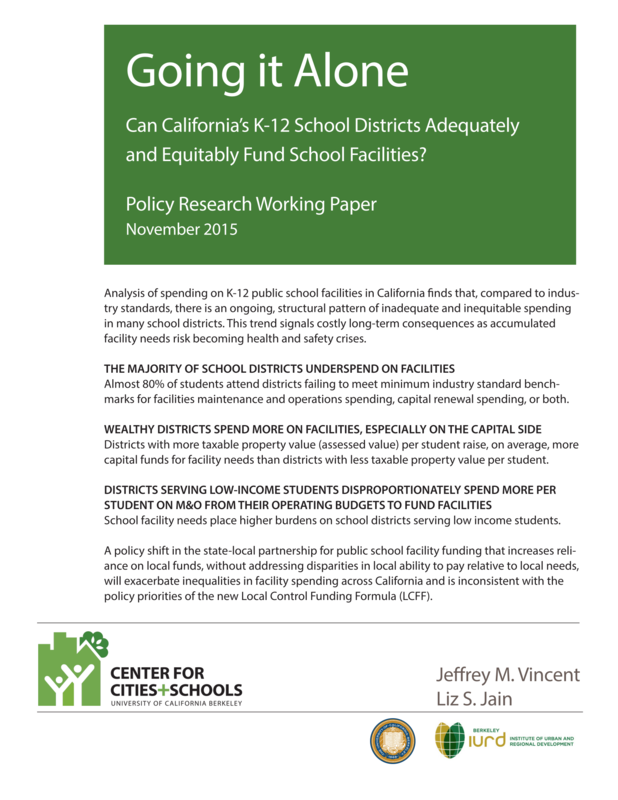 GOING IT ALONE: CAN CALIFORNIA'S K-12 SCHOOL DISTRICTS ADEQUATELY AND EQUITABLY FUND SCHOOL FACILITIES?